← Nomad Factory’s Integral Studio Pack III on Promo for only $129 – Last Days! 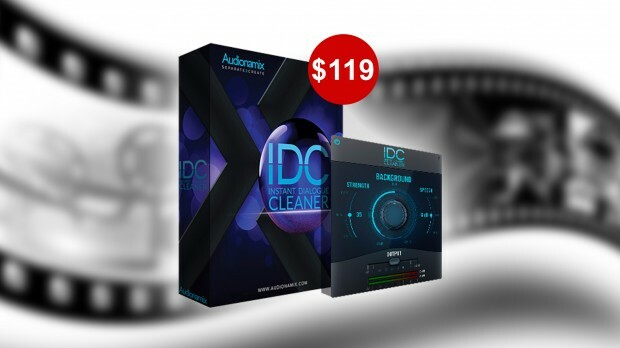 Audionamix has released the 1.5 version of their IDC – Instant Dialogue Cleaner plug-in at an special introductory price of $119 until the 12th of December. The IDC Instant Dialogue Cleaner plug-in is the first real-time, cloudless solution from Audionamix. Based on artificial intelligence, IDC offers unique and effective dialogue cleaning technology through an intuitive interface. IDC 1.5 now boasts unlimited gain reduction for unwanted background interference. Completely remove wind, troubleshoot roomy files and control complex, varying background noise such as birds, insects, car and plane bys, and music, all with the turn of a knob. IDC 1.5 also expands compatibility for Adobe Premiere CC, Final Cut Pro X, Logic Pro X and macOS 10.14 Mojave systems. The free IDC 1.5 update will be accessible for all current IDC owners from the IDC download page. This entry was posted in DontCrack, Plug-ins, Promotions and tagged Adobe Premiere CC, Audionamix, background noise cleaner, dialogue cleaning technology, Final Cut Pro X, IDC, Instant Dialogue Cleaner, Logic Pro X, unwanted background interference. Bookmark the permalink.